With an increasing number of TV channels and programs coming into our homes each day, it can be hard for parents to monitor what their children are watching. Many parents are concerned about their young children watching programs with content that's more suitable for older children or adults. Let's face it, there are some things on TV that children are better off not watching. There are many parents that would like to censor what their kids watch on television, but are left wondering what options they have. There are many electronic devices and parental controls that can help parents control what channels and content their children watch. The television industry designed a TV ratings system to give parents more information about the content and age-appropriateness of TV programs. These ratings, called the TV Parental Guidelines, are modeled after the familiar movie ratings, which parents have known and valued for decades. They are designed to be easily recognizable and simple to use. The Guidelines apply to most television programs, including those directed specifically to young children. However, sports and news shows do not carry the Guidelines. The Guidelines appear in the upper left corner of the TV screen at the beginning of TV shows, and often again after commercial breaks. Why Parents Need TV Parental Control? 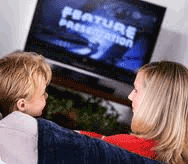 Television watching itself affects child development regardless of the program's content. Recent research show that television watching adversely affects children's thinking, speaking, imagination, senses, physique, feelings, and behaviour. It is important for parents to be aware of these effects. TV addiction. Not unlike drugs and alcohol, TV watching allows the participant to blot out the real world and enter into a pleasurable and passive mental state, where worries and anxieties cannot intrude. The typical vacant state of someone on drugs or alcohol is very similar to the state of the TV watcher. Anti-social behaviour. The content of violent programs may affect children's behaviour, for children learn by imitation. However, the nature of the TV experience regardless of program content may cause antisocial behaviour. Relating to others more as objects than human beings, a result of TV watching, can contribute to violence. Also, the television experience gives an illusion of participating in an activity when in fact one is totally passive, so that children who are heavy viewers are less able to judge the feelings, expectations and problems of others in real life situations. TV retards brain development. The brain is patterned by the senses, by movement, speech, thought and imagination. As the brain develops, children shift from a non-verbal "right hemisphere" dreaming consciousness to a verbal, logical "left hemisphere" state. Television watching prolongs children's dependency on the right hemisphere. What Parents Can Do for your Kids? Restrict firmly the number of programs watched, or, if you are resolute enough, get rid of the TV set altogether. Or put it away and use it only for very special occasions. Offer alternative activities of a creative sort, e.g. crafts, puppetry, dressing-up drawing and painting, modeling, pets, various hobbies, sports, music, fork dancing, nature studies, gardening. Aim at a positive and warm family life, interesting mealtimes, bedtime stories, singing, nursery rhymes, etc. Try to find friends who think the same way and help each other, e.g. organizing children's parties together. Make full use of TV Parental Control to monitor and control your kids' television viewing. TV Parental Control can provide parents a reliable solution to make sure your kids television viewing by monitoring and control the programs. This TV Parental Control allows parents to block programs they believe are unsuitable for their children. It runs silently and unobtrusively while logging everything that happens on your kids' computers. TV Parental Control work whether you are not at home or in the room viewing with your children. With all of the products that are available to help parents control children’s media consumption, deciding what to use can be confusing. Parents may not even be aware of tools that are already available to them through their cable or satellite services, TVs, Personal Video Recorders (PVRs), and other media center electronics. Most parental control tools function to block or filter contents or a combination of the two. The following is a brief overview of the different types of parental control devices available. Click on the heading links for more detailed information about the products available for each type of technology. As of January 1, 2000, the FCC has required all television sets with picture screens 33 centimeters (13 inches) or larger to be equipped with features to block the display of television programming based upon its rating. This technology is known as the "V-Chip." The V-Chip reads information encoded in the rated program and blocks programs from the set based upon the rating selected by the parent. Filtering technology filters out offensive content from TV or movies, allowing children to watch an edited version of the program. Some filters are available for the television which block out offensive language. Blocking technologies allow parents to lock children out of viewing media content in several different ways. For television programming, blocks can allow parents to lock certain channels, prohibit shows of specified ratings from playing, lock out viewing for specified time periods, or a combination of these methods. This technology is built in to many TV sets, and is offered by cable companies, satellite companies, and PVR systems.